Homes like this one, recently sold by RE/MAX Property Source, are sitting on the market for less time than those sold in recent years. The past decade has brought a roller-coaster ride of highs and lows for the real estate market, but there’s a sense that things are steadily improving – both around the nation and in Rockford. In many ways, today’s buyers, sellers and builders operate with different expectations than they did before the 2007-2008 housing market crash. Affordability, foreclosures and new lending requirements have presented many challenges, as have property values and tax rates. But the rising economic climate is generating new opportunities. Young people are pursuing their first homes, interest rates are low and new economic promises have generated a positive outlook for many. Real estate professionals in our region agree that we’re not yet in the clear, but today’s market is filled with potential. 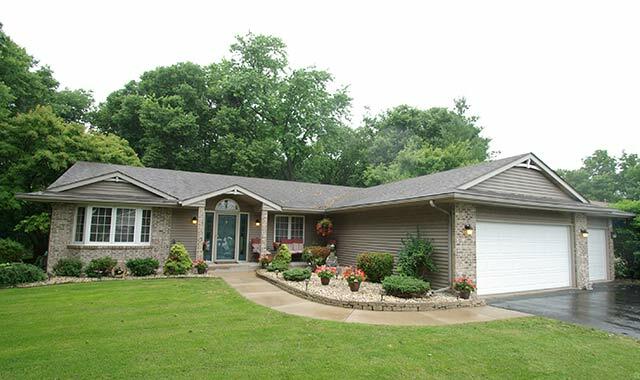 “In general, the market in Rockford is gradually improving and is improving steadily,” says Jon Krause, president of Gambino Realtors, 3815 N. Mulford Road, Rockford. His firm is one of the oldest and largest real estate companies in the region, with more than 100 agents. In fact, this past September, mortgage interest rates hit 4.16 percent, the lowest rate since data was first recorded in 1971, according to the Illinois Association of Realtors. Another positive sign is the fact that there were twice as many homes for sale during the recession as there are now, says Krause. Primarily, this trend is related to faster-moving inventories, and it signals positive changes and growth in the market. Sales this year are off to an impressive start. Looking just at the month of February, home sales increased 23 percent year-over-year, from 197 homes sold in February 2014 to 242 homes sold this February, says Bois. It’s a promising sign that 2014 was a banner year for home sales. For those looking to sell their home, this year might be a good time to enter the market. According to Humpal, taxes and property values in our region may cause buyers some hesitation. As area tax rates have risen, property values have decreased. Increasing value is important to buyers. “We’re slowly recovering, and hopefully, our governing fathers will figure out a way to ease the tax burden on housing – which is at a historic rate of 14.0023 percent in Rockford – so we may once again flourish,” he says. Along with property values, other aspects of the marketplace are still struggling to find their footing. Some of the biggest changes in the market have hit homebuilders, who have faced an intense cutback in new home construction. Despite the challenging climate, builders are finding innovative ways to support homeowners. The same forces conspiring against homebuyers in today’s market – property values, rising costs – also are conspiring against homebuilders, says Frank Gambino, owner and president of Gambino Building & Remodeling in Rockford. Surprisingly, it may be more affordable this year to buy and renovate than to build new. Around the region, building has slowed down considerably. According to Gambino, since 2010, the Rockford region hasn’t had more than a few dozen building permits issued in any given year. Rather than build new, more homeowners are focused on improving their current homes. Dennis Sweeney, executive vice president of the Home Builders Association of Rockford, notes that many home builders have increased renovation services to include projects like expanded garages and storage units. “What people are now doing with their money is finding ways to make the houses they have more efficient,” he says. Not only does the homeowner get the satisfaction of a refreshed space, but home renovations can add value and increased selling potential. Gambino’s firm has kept busy updating kitchens and basements, and leading other projects such as home additions. His clients have seen a positive impact from their home renovations. Before homeowners jump into a home improvement project, Gambino recommends doing some homework. Besides planning your own budget, it’s important to consider the desires of whoever might buy your home. One of the top reasons to buy this year is record-low interest rates. Also, new federal assistance programs provide a way for first-time homebuyers to qualify for loans with down payments as low as 3 percent. The @Home Illinois loan program, for example, offers a 30-year, fixed-rate mortgage that has a number of benefits for first-time buyers, including low down payments, federal tax credits and homeownership counseling. Looking toward the future, real estate studies predict that industrial growth around Rockford could provide a boost to the local housing market, Bois says. Endeavors such as expansion at the Chicago-Rockford International Airport, the new Woodward production center in Loves Park, Ill., and additional developments are likely to bring in talented professionals from outside the area, thus increasing demand for local housing. Bois also believes that, if the Transform Rockford movement is successful in improving the area’s social and economic well-being, it would contribute to a housing expansion by bringing in new jobs. Many forces at work right now bode well for the future of the housing market, Bois says. Empty-nesters looking to downsize are putting their homes up for sale. Improvements within the Rockford Public Schools are attracting newcomers and encouraging families to stay put. New, vibrant community events and activities are drawing people to the city and its downtown. At the same time that improvements are making Rockford a more attractive place to live, a new generation is stepping into the market. Bois says that according to industry research, millennials – people born between 1981 and 2000 – are expected to form new households in significant numbers this year. Years of pent-up demand could lead this market segment to “break lose” in the near future. “The millennial generation is beginning its ascent,” Bois says. “About 65 percent of first-time homebuyers are part of the millennial group, and they’re at an age when many people marry and start families.” Which, in turn, reflects an environment of stable jobs and schools. Homeownership is one of Americans’ most basic aspirations, and it provides a positive impact on the community. Homeowners feel a greater connection to their community and their neighbors, and tend to be more invested in civic and social institutions, according to research by the National Association of Realtors. Owning your own home can even help to build stable neighborhoods, reduce crime, and improve a community. Our homes are an important signal of our identity. In our region, the amount of home we can buy with our dollars is one of the greatest opportunities. With the Federal Reserve indicating that interest rates will once again be on the rise, after being low since the recession began in 2007, this year may be a great time to buy or build the home of your dreams.